Courses are subject to change at the discretion of UAB. Students on this program can take up to 15 credits. Recommended credits are shown in parentheses. Students who test into Spanish levels A1, A2, B1.1, B1.2, B2.1, B2.2 have the option of taking either a 45-hour Spanish course for 3 credits or a 90-hour Spanish course for 6 credits. Spanish language is not required although AIFS highly recommends that all students take a Spanish course in order to benefit fully from their study abroad experience. Students who place into the Superior level may attend courses with Spanish students. The courses will be taught in Spanish or Catalan in a wide range of academic disciplines. The academic calendar is different from the Spanish Language, Liberal Arts and Business Program described in this catalog since the exams for these courses are in February for the Fall and June for Spring. Contact the AIFS Admissions Officer for more information. On both campuses, small groups are the norm, and all Spanish language professors are native Spaniards. Professors for other disciplines are highly educated experts in their fields who come from all around the world. This level is for students who have no previous knowledge of Spanish. During this course, students will be able to understand and express themselves in everyday situations and those related to personal experiences. Students will be able to exchange simple and direct information. Included topics are: present tense of regular and irregular verbs, demonstrative and possessive adjectives, pronunciation and intonation, uses of “ser”, “estar” and “hay”, frequent reflexive verbs and definite and indefinite articles. Students who have studied Spanish only in high school or one or two semester(s) in college generally place in this level. Students will be able to understand and express themselves in everyday situations and those related to personal experiences, with basic language recourses. Students will be able to exchange simple and direct information. Included topics are: forms and uses of the gerund; forms and uses of “gustar”, “encantar”, “interesar”, the differences between “ser” and “estar”, the preterit perfect tense; positive imperative and expression of cause and excuse. Bilingual students generally place into this level. The course is similar to Spanish 401 but with greater emphasis on prepositional patterns of verbs, problematic prepositions, proverbs and sayings, lexical adaptations on different sociolinguistic levels, and varied conversational recourses. The Eixample Campus is in the heart of Barcelona. Business, Economics and Politics are the focus of the courses taught at the Eixample Campus. Students can choose from subjects taught at this or the Sant Pau campus as the connection between campuses is easy and can be made in only 18 minutes. All courses are taught in English unless specified within the course description. Aims to increase awareness of the impact of national cultures on business. Students will be provided with theoretical and practical tools to improve their productivity. Cultural dimensions analyzed include: individual versus collective identity; rigid versus flexible norms (price, business contract); task (“specific”) orientation versus people (“diffuse”) orientation; power distribution and vision of time and priorities. Focus is on the economic foundations of international business and the main forces that shape business across countries: political, economic, cultural, and legal forces. The last part of the course will analyze the internal aspects of a firm oriented towards international business. Extends the principles of finance to the international context. Topics include: exchange rate determination; foreign exchange markets; currency derivatives; currency forecasting; offshore markets; saps and interest rate derivatives; risk management and cost of capital for foreign investments. Evaluates cultural differences and aims to enhance student skills in developing and implementing marketing strategies and decision making in the international contexts. Addresses the environments faced in international markets (cultures, economic systems, financial markets, governments and legal systems) and then analyzes in depth the elements of global marketing strategy (product, price distribution) and its implementation. Students will learn to understand the relationship between strategic planning and business performance. They will conduct in-depth organizational, industrial and environmental analysis as well as appreciating how the differences in the economic, sociocultural, political and legal environments among countries affect the decision-making process and strategic paths. A deep analysis in terms of interrelations which exist between marketing processes, operations, logistics and human resources in the services industry. Topics covered include: fundamentals of services marketing management; buyer behavior and segmentation; service relationships and brands, and creating the service experience: price, promotion and place. Develops the appropriate competencies and promotes the right attitudes and behavior. Students will also have to design a marketing plan where they are the product. We will study the latest trends in job searching as well as web 2.0 technologies to create one’s personal branding and product placement in the labor market. Explores business creation and growth as a multidimensional phenomenon in both independent and corporate (“intrapreneurship”) settings. By linking theory and practice, the course aims to provide students with an entrepreneurial perspective and a hands-on experience in the development of new business ventures. Explores the technical underpinnings as well as the legal and fiscal environment of e-commerce, particularly in the Spanish arena. Students will understand the concepts related to marketing online and publicity on the Internet, and will develop business strategies to conduct e-commerce. Focus is on the economic foundations of international business and the main forces that shape business across countries: political, economic, cultural, and legal forces. The last part of the course will analyze the internal aspects of a firm oriented towards international business. Prerequisite: Advanced level Spanish. Evaluates cultural differences and aims to enhance student skills in developing and implementing marketing strategies and decision making in the international contexts. Addresses the environments faced in international markets (cultures, economic systems, financial markets, governments and legal systems) and then analyzes in depth the elements of global marketing strategy (product, price distribution) and its implementation. Prerequisite: Advanced level Spanish. Through business cases, debate, teamwork and role playing, students will learn the basics of management and leadership. Topics covered include: Human Resources management, career orientation, compensation and benefits, time management, emotional intelligence, professional selling skills and international organization structures. Centres on the challenges and opportunities associated with the organizational management and business strategy in emerging economies. Business cases in emerging economies from diverse geographical regions such as Asia, Latin America, Middle East and Eastern Europe will be discussed. Provides students with decision theory and game theory tools that can be useful not only in business environments but also in everyday life. Students will learn how to solve and analyze decision problems and games. Prerequisite: basic knowledge of Microeconomics and Mathematics. International economics is divided into two broad subfields: international trade and international money. Topics include labor productivity and comparative advantage: the Ricardian model; resources, comparative edge and income distribution; the standard trade model; international mobility of labor and capital, and the political economy of trade policy. Studies the crucial role of creativity and innovation in the 21st century and provides students with the tools to be effective actors of change in their organizations in the future. Investigates the development of international and global inequality; inequality within nations; gender inequality, and long term poverty. Has inequality increased over time? Does globalization make the world less equal? What policies have been implemented to reduce inequality and how effective have they been? Deepens students’ knowledge of the institutional functioning of the E.U. as well as its most important economic policies. Reviews policies including: agriculture with an emphasis on possible future reforms; regional in the light of increasing competitiveness brought on by each successive step in European integration, and trade including a discussion of the most important economic accords between the E.U. and other countries. Through discussion on current policy on European integration, students will be able to apply and relate conceptual and theoretical knowledge underpinning the course of the economic and political process of European integration. Prerequisite: basic knowledge of Microeconomics and Macroeconomics. Examines the main changes and theories in society, politics, economics and war since 1914 focusing on the different academic schools that tried to explain the major changes that affected people during the 20th century. One important element to be studied in this course is war, understanding this element as the last tool used by the State to achieve goals or stability. This is an introductory course to the politics of development from a comparative perspective. Students will be addressing development issues across different points in time and across different world regions. Two main topics/concepts will be analyzed throughout the semester: development and the state. Geopolitics is the art and practice of using political power over a given territory. Students analyze geography, history and social scene regarding spatial politics and patterns (ranging from state to international). The past and present are explored (Cold War and aftermath, North and Middle America, South America) before turning to the future (China 2020, American Power and the crisis of 2030, the 2040 prelude of war). Students will learn to appreciate and adopt different registers and to apply the appropriate terminology according to social convention. They will also learn to take structured and meaningful notes from meetings and to write reports, letters, memos and all business-related documents. Prerequisite: Students must place into Intermediate level (B1.1) Spanish language or higher. The beautiful historical pavilions of the Sant Pau campus provide the backdrop to the Art, Architecture and History electives taught at the magnificent UAB Casa Convalescència building. Students can take subjects from either campus as the connection between campuses is easy and can be made in only 18 minutes. All courses are taught in English unless specified within the course description. The evolution of the city of Barcelona is explained using concepts of urbanism, politics and society. 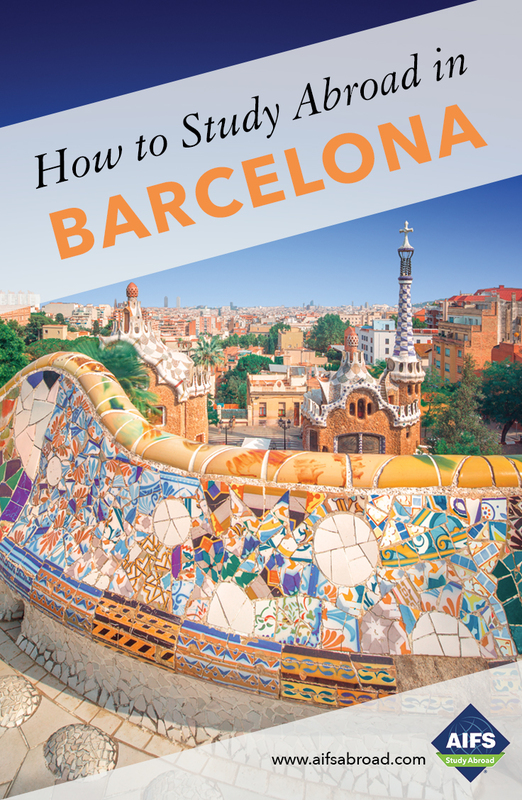 Students will compare Barcelona to other cities such as Madrid, Paris, London, Moscow, New York or Washington D.C. This introductory course examines the concepts behind the work and the evolution of Spanish art in relation to similar movements in Europe and the United States. Includes visits to relevant exhibitions in Barcelona and talks by professional artists. This introductory course examines the concepts behind the work and the evolution of Spanish art in relation to similar movements in Europe and the United States. Includes visits to relevant exhibitions in Barcelona and talks by professional artists. Prerequisite: Students must place into upper Intermediate level (B2.1) Spanish language or higher. From prehistoric times to the present, dealing in more detail with the Baroque period, Modernism and 20th century art. Regular visits to museums to keep the class as close to real artistic practice as possible. Students are expected to contribute to class development with questions and commentaries, reading assignments and visiting exhibitions in preparation. Interest in art and architecture is a prerequisite. Students will get in-depth knowledge of digital cameras, learn the basics of composition, retouch images and learn about, and get inspiration from, some of the historical masters of photography. Students will then apply what they have learned and use their skills to work on an individual photography project. **Students are require to have a DSLR, Bridge or Rangefinder camera for this class. Students will be able to recognize masterpieces of Spanish art and understand the reasoning behind their unanimous positive appraisal. Analysis of artistic characteristics and their social and historical implications. Instruction includes lectures and field visits. Examination of the buildings most representative of each period that have been included in UNESCO’s World Heritage List for having outstanding universal value. Instruction includes lectures and field visits. Contemporary art is becoming ever more interdisciplinary, at times confusing and unclassifiable, where all kinds of fusions, exchanges, frictions, transactions and dialogues are occurring. This course is an introduction to some of these new tendencies and how they are explored by Spanish Contemporary artists. Students develop an understanding of fundamental elements which assist with the observation of painting and sculpture. The course then looks at works of art as urban interventions with reference to the cityscape of Barcelona. Students will participate in scheduled visits to museums and public spaces. The history and cultural context of Modernism will be addressed in the classroom; however special emphasis is placed on practice outdoors. Students will sketch in front of buildings and in museums. No previous artistic training is necessary. The goal of this module is to gain an insight into the different strategies and operational activities of Catalan and Spanish institutions and companies working within the European framework. Students will maintain direct contact with the business and economic world in Barcelona where, with the full personal support and collaboration of the Instructor, they will gain hands-on experience of observing, researching, interacting with and analyzing a range of local companies. Direct personal interviews with Business Managers are designed to supply students with first-hand, unique testimonials related to managerial experiences, competitive advantages and daily operations. The real life experience of this course helps students to bridge the gap between theory and practice. Each visit is prepared in advance following specific guidelines. This course is designed for students to gain a basic understanding of the Catalan language in order to be able to use it in everyday life while in Barcelona. The aim of this course is to increase student understanding and awareness of the impact of our differences on the way we communicate and receive messages. The main differences the course focuses on are nationality, race, class, gender and religion. We will study and observe how different identities under those categories affect people’s perceptions of themselves as individuals, themselves within their groups, themselves within other groups, and how those perceptions affect the way they communicate and interpret messages. Provides an extensive view of Spanish history before examining different cultures within Spain. Focus is mainly on language, nationality and political implications. The rest of the course will travel throughout the various aspects of Spanish civilization, portrayed through artistic expression (architecture, painting, literature, music and cinema). Provides an extensive view of Spanish history before examining different cultures within Spain. Focus is mainly on language, nationality and political implications. The rest of the course will travel throughout the various aspects of Spanish civilization, portrayed through artistic expression (architecture, painting, literature, music and cinema). Students must place into upper Intermediate level (B2.1) Spanish language or higher. This course aims to explain the evolution of Spain since 1898. Politics, society, family and economics will be covered. By the end of the course, students will be able to understand major changes that took place in Spain since the defeat of the Spanish Armada in Cuba in 1898. A broad introduction to the main evolution of the Mediterranean using not history but its cultures, religions and peoples. The main topics covered are: Judaism, Christianity, Islam, Greece, Rome, Germanics, Byzantines, the Atlantic and the Mediterranean, the Renaissance, the Mediterranean family and the Modernization of the Mediterranean Societies. After the Olympic Games of 1992, Barcelona became an international tourist destination; but a short visit cannot account for the cultural complexities of the Catalan capital. In order to know any city, to “dwell” in it, we need to become familiar with its oral history, paintings, architecture, sculpture, and literary texts. More specifically, the more we learn about the literature of Barcelona, the more we shall know about its culture, past and present. For this reason this course will explore the city through though the eyes of artists and writers. We shall start in the nineteenth century with the rise of the modern metropolis that we know today and finish with the post-Olympic urban reality of the twenty-first century. Explores what shaped the Mediterranean political scenario from the French Revolution (1789) to the Barcelona Process or Euro- Mediterranean Policy. The focus is on: the French Revolution, the emergence of Modernity and Liberalism in the Mediterranean, Italian Unification, European Imperialism in North Africa and the Middle East, dictatorships in the Mediterranean, the two World conflicts and the Cold War in the Mediterranean. Highlights the urban dimension of European society, referring to the different phenomena that European (and Spanish) cities face today. Students are introduced to the economic, political and social factors that configure urban Europe in order to understand its development in a global world. The course combines theoretical and practical sessions, presenting case studies of different European and Spanish cities. Field trips are a component of this course. Covers each region of the Middle East since WWII. Both the Carter Doctrine (1980) and George W. Bush’s Greater Middle East and North Africa Initiative (2004) provide the references through which each region is studied, together with North Africa, the Horn of Africa and the Area of Influence of the Central Command. Ideas of Nation, Nationalism and State are examined using the Catalan Case and the evolution of such ideas in the West. Characteristics of different ideas of Nationalism and the main evolution of the Catalan identity as well as tensions in the Basque country will be covered.